Most people know of Tintagel in Cornwall and the Legend of King Arthur. The Medieval historian Geoffrey of Monmouth claimed Arthur was conceived at Tintagel, a myth that has helped make it one of the most visited archaeological sites in Britain. A major excavation project begun in the 1990’s has since published its conclusions. Tintagel is a craggy mound of splintered grey rock and rough grasses constantly pounded by Atlantic waves. Only a narrow neck of land connects it to the North Cornish mainland. The site is dominated by the remains of a castle built in the 13th century by, Richard, Duke of Cornwall. Tintagel Castle Ruins Photo Courtesy of English Heritage. The outer defences lie on the landward side of the neck, the main bastion immediately opposite on the southern edge of the ” island”. 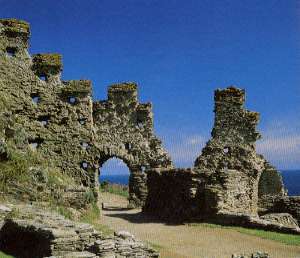 These ruins draw the attention visitors who believe that it must be Arthur’s castle. The true greatness of Tintagel is represented not by its medieval castle, but by the reconstructed slate dwarf walls that mark the site of modest rectangular buildings excavated on the eastern terraces of the island. It was here that Raleigh Radford uncovered the building foundations and scatters of imported pottery that identified Tintagel as a major site of the 5th-7th centuries AD. Radford had worked on Tintagel in the 1930’s and again in the 1950’s. He was amazed by the pattern of small scale structures, built on terraces distributed across the mound . Who would choose to live in such a place, perched on crags lashed by such strong winds and rain. The Rough Seas of Cornwall. 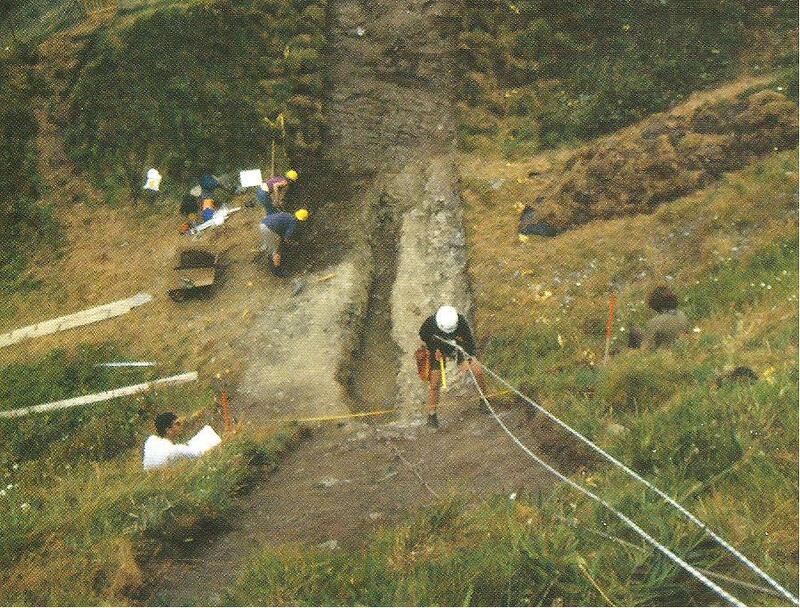 In 1990 a new phase of work began at Tintagel commissioned by English Heritage to carry out fresh investigations on the island and attempt to resolve a debate of the nature of early Dark Age Tintagel, the Glasgow Research Team conducted a series of short survey and excavation seasons between 1990 and 1999. Radford’s work was re evaluated both on site and in the archives and the project finally concluded with the publication of a grand monograph that summarises the results. The overall picture of Tintagel now looks very different. It has come closer to imagining a place where a King might have been sired. Instead of a little community of Celtic monks. Radford had discovered a number of small scattered structures which he had taken to be individual ” cells ” characteristic of an early Dark Age monastic community but the impression was deceptive. The island is subject to erosion and slippage, many of the slopes are covered by scree. In some cases evidence had been lost entirely, and in others, lay too deeply buried to be discovered. The site had been intensively worked on and where buildings were found some were rectangular some square ones others with stone footings only, perhaps for turf walls or timber-framed superstructures, others were curvilenear or irregular shaped. When the Glasgow team re excavated they found evidence of various other structures which Radford had missed and the impression was that many stone- built and less substancial stone and turf constructions had once rested on the terraces. The Glasgow Team Excavation at Tintagel. Photo courtesy of English Heritage. Excavating on the lower terrace of site C, the Glasgow team discovered several phases of stone and turf structures associated with, floor deposits, and stoke holes, The phases were separated by layers of tiny flakes of slate in sandy clay soil. Rich assemblages of domestic debris in the form of pottery and samples of charcoal for radio carbon determination were found. This revealed three distinct periods of building work: cal AD395-460 for an early phase of hearths ,floors, and stoke- holes pre-dating the first appearance of imported pottery; cal AD 415-535 for a later phase in which Romano-British and imported pottery were both present in significant quantity and cal AD 560-670 for the latest and best- preserved structure and the largest assemblage of imported pottery. A small group of 21 Romano-British pot shards Gabbroic(5), Granite (l Shard) and local ( l5 shards)- was swamped by a huge assemblage of imported ( 5th – 7th century ) pottery. In total there were 1,821 shards in this category. The assemblage included four types of amphorae from Greece (bi) Turkey ( b ii and probably B iv), and possibly North Africa BV. There were also course wares from the eastern Mediterranean ( Red ware and sandy cream ware, and fine wares for the table, mainly Phocaean Red slipped ware (PRSW) and African Red slipped ware (ARSW) also a single shard of Bordeaux- region D. ware. The African and possibly the course wares record the import of luxury communities such as wine. The fine wares may indicate Mediterranean- style eating and drinking as a mark of Elite status. At least nineteen separate vessels are represented in all, of which sixteen are 5th to 7th century imports. A thin slate plaque was found which apparently had had two inscriptions incised upon it and had been trimmed and re-used as a drain cover. The earlier inscription- on the evidence of the forms of letters- dates from AD 400. It seems to be inscribed HAVG- Honorius Augustus- The Emperor Honorius. If the reading is correct, this is a very important discovery. Honorius was the Western Roman Emperor from AD 395 to 423. The second inscription appears to compromise a series of names from the 6th century AD but we have no way of knowing who these men were. There names are Roman (Paternus / Paterninus) or British (Late British, or Neo-Brittonic, a kind of proto-Cornish It seems interesting that these men chose to inscribe their names on a slab which appears to have worn the imprint of a Roman Emperor. This may have been a lineage of ruling men, maybe lords of Tintagel. Tintagel like the Cadbury sites are of extreme ” high status” in Western Britain in the post Roman period .archaeologically the site is at the top of the social hierarchy in this period, so it is difficult to envisage Tintagel as anything other than a site of the Dummonian rulers. It was an enclosed settlement on a hilltop promontory, from which control could be maintained of passing shipping and of maritime-based trading activities, whether local, regional or long distance. However this is not to imply year-round residency of the Dummonian ruler. It is likely to have been one of a few such centers, comparable with the village regales mentioned by Bede in relation to early Northumbria. At times when the ruler was not present a ‘caretaking’ group must still have been in residence. Susan Pearce elaborates on the seasonal aspect: , this suggests that Tintagel was visited occasionally and that it functioned as the summer meeting place of which the local ruler met lesser men, transacted business, and fostered the important personal relationships upon which, in part, his power depended. Perhaps we as Arthur enthusiasts have captured a little truth about Tintagel; It seems likely that it was a seat of power of the very type of Dark Age war lord from which the whole Arthur legend derives. The Olive tree is the only tree that grows almost exclusively here in the Mediterranean. Today the olive tree covers more than 10.8 million hectares of cultivated land around the world, of which 95% is in the Mediterranean region. One can see both wild and cultivated olive trees in this part of the world; they have more or less the same climatic requirements. Wild olives are found mainly in the lower altitudes- between sea level and 300m- along the shores of the Aegean, the coast of southern Turkey, the maritime belt of Lebanon ,and Israel as far south as Mount Carmel. Greece is the now third worldwide for the production of table olives and olive oil however, the situation was different in Antiquity . The oldest tree at Ano Vouves Crete is believed to be at least 2,000 to 3,000 years old. It still produces olives. During the second millennium BC, Crete produced large quantities of High-quality olive oil, on an industrial scale; a valuable trading commodity of great economic importance, which the Minoans made well know to the rest of the Mediterranean, ultimately ,the world. 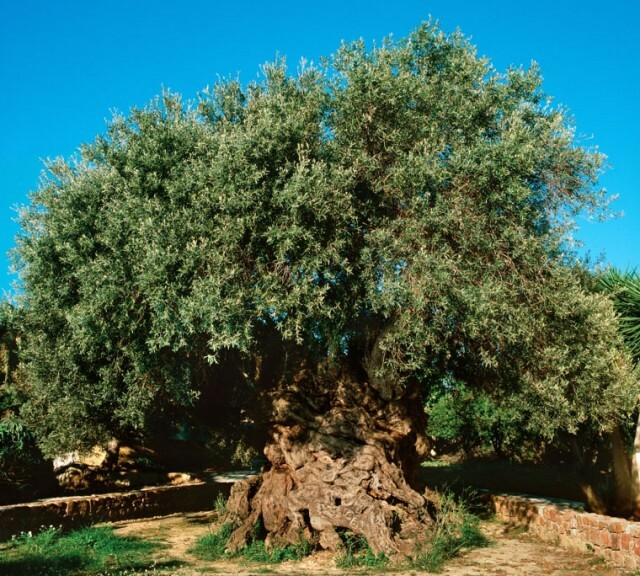 The olive tree described by the Roman writer Colmella as the ‘The Queen of all Trees’, is very tough : with proper attention it can survive for centuries, sometimes for millennia. Even where the tree has suffered from disease, fire or frost , as long as part of the root structure remains intact, new shoots can emerge from the root or the bole that will regenerate the tree. This extraordinary ability to survive and regenerate itself gave rise to the tree’s reputation for immortality . It became connected with various legends in Antiquity. One story tells how the goddess Athena won from Poseidon the patronage of Attica with the gift of the olive to Athens. The olive was sacred to Athena appearing on the Athenian coinage, and it was a design used for the decoration of vessels and frescoes. According to the ancient writer Pausanias, when the Persians set fire to Athens, the olive was burnt down ; but the very same day it grew again to the height of two cubits. Indeed olive shoots sprout readily from a stump. The great age of some existing olive trees suggests it is perfectly possible that the olive tree of the Acropolis goes back to a much earlier date than the classical period. If we want to see the steady growth in importance of the olive throughout the Bronze Age, we need to study the actual remains of the plant themselves. This can best be done by using pollen analysis . Oliver Rackham of Cambridge University and Jennifer Moody of the University of Texas at Austin show there was a substantial presence of olive trees on the west of Crete during the Late Neolithic , before the big take off in the Bronze Age (3000-2100 BC). From then onwards there are indications for large-scale olive cultivation. Evidence of this comes from charred olive stones and pieces of charcoal retrieved from archaeological excavations at Myrtos, Vasiliki, and the early levels at Knossos itself where Jane Renfrew studied the botanical remains. The big expansion comes in the middle Bronze Age (2100-1700 BC ). This is the time when the sites at Knossos, Phaistos and Malia are becoming real palaces, and finds of olive stones and olive wood become more numerous. Further evidence comes from the Minoan towns at Kommos and Palaikastro in east Crete, and from rural sites at Chamalevri and Smari. But it is during the period of the palaces that the olive achieves its peak of production..In Crete, the olive becomes the prestige object par excellence, used by the rulers to demonstrate their power and wealth, and thus, inevitably, it was over produced. According to Sir Arthur Evans, the first excavator of Knossos, in his seminal study The Palace of Minos, first published in 1935, the storage facilities at Knossos could hold more than 246,000l of olive oil. A good example of this is the conical cup full of complete olive fruit from a well at the palace of Kato Zakros- the smallest of the four main palaces in Crete. Below An example of large Pithoi from Knossos. Olive oil was used in Prehistoric Crete in many different ways. First and foremost it was a component of the diet, though possibly to a lesser extent than today. 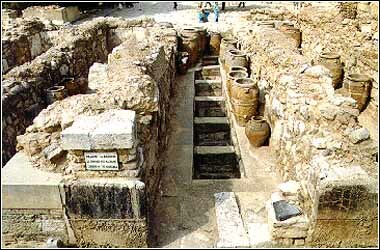 It was also the base for cosmetics and beauty products, both as a cleanser and for perfumed oils and creams. Organic residue analysis of the contents of pottery storage and cooking vessels shows traces of olive oil and aromatic oils from the Mycenaean and Minoan periods..
At the 2nd millennium site of Chamalevri in central Crete, for example, olive oil was mixed with iris oil , honey and resin as has been recorded by Yiannis Tzedakis and Holley Martlew in their project entitled Minoans and Mycenaean’s: Flavours of their time, which focused on their residue analysis from vessels recovered in various excavations. Another major use of olive oil was for lighting. 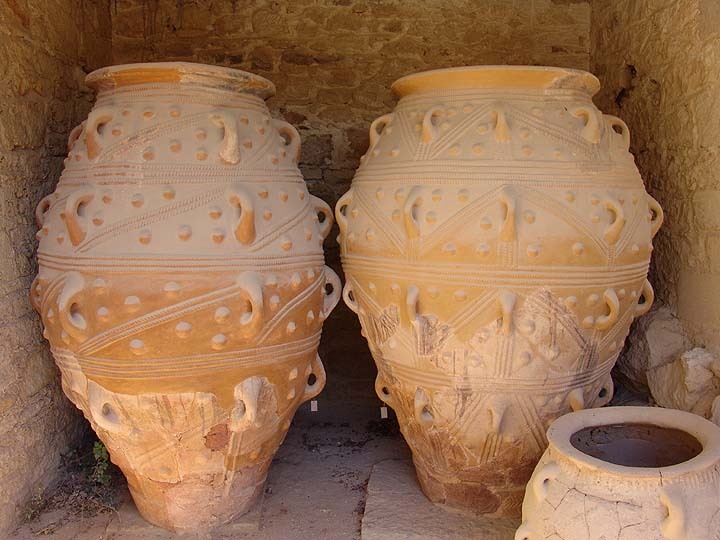 Clay lamps using wicks immersed in a flammable liquid were common objects in Early and Middle Minoan tombs on Crete. 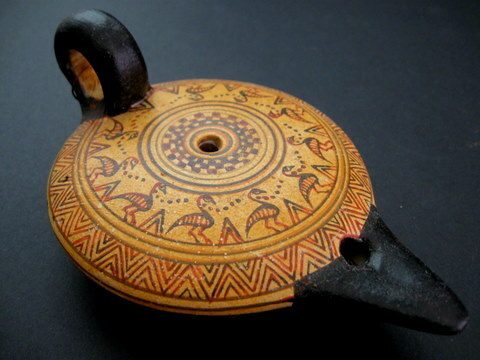 They are found also in settlements such as Koumasa, Mochlos and Myrtos, In the Middle Minoan period stone as well as clay lamps began to be used throughout Crete,and from that time became a standard element of Minoan life. Almost every house of the period has produced at least one lamp-sometimes more.